L.F. Pivarnik, A.G. Senecal, and A.G. Rand, Hydrolytic and Transgalactosylic Activities of Commercial beta-Galactosidase (Lactase) in Food Processing. L. Slade and H. Levine, Glass Transitions and WaterFood Structure Interactions. D.S. Jackson and D.L. Shandera, Jr., Corn Wet Milling: Separation Chemistry and Technology. Subject Index. The appearance of Volume 38 marks a transition for Advances in Food and Nutrition Research as Steve L. Taylor assumes editorial responsibility for the series. 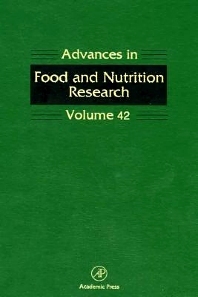 Under John Kinsella's guiding hand, Advances in Food Research strengthened its reputation as the leading publication for comprehensive reviews on important topics in food science, evolving into Advances in Food and Nutrition Research, a title which better reflected his interest in the integral relationships between food science and nutrition. Building on this legacy of quality scholarship, Dr. Taylor brings a fresh perspective to the serial, seeking novel approaches to research in food and nutritional science.